This trail follows what was the shoreline of ancient Lake Bonneville. Various sections of the trail run from Ogden down to Payson. The trail is mostly single-track but you will transverse some double-track, as various other trails cross or merge with the Shoreline Trail. Bonneville Shoreline trail can be accessed throughout the various trails in the East foothills. The Indian Trail is a moderate hike that ascends climbs steeply into Ogden Canyon, winds in and out of Warm Water Canyon, climbs to “Nevada Viewpoint” on the ridge between Warm Water Canyon and Cold Water Canyon, and then descends to into Cold Water Canyon near the Cold Water Canyon Trailhead. This trailhead is located at the top of 22nd Street, on the east side of Ogden, near the mouth of Ogden Canyon. There is a paved parking area but no other facilities. Warm Water Canyon is an easy-to-recognize landmark along the trail. The Cold Water Canyon Trailhead is in Ogden Canyon, about 1.5 miles up from its intersection with Valley Drive (at Rainbow Gardens). There is a Smokey the Bear sign along the highway by the trailhead. Located on the east side of Ogden, the summit of Malans Peak offers dramatic views out over the community, the Great Salt Lake and the surrounding mountains. The trail is signed and easy to follow. The route is somewhat steep, but not too bad. There are excellent views at several points along the trail, and so you don’t have to make it to the summit to enjoy a hike here. Strong hikers can continue past the summit into Malans Basin, which is a popular camping spot for backpackers. The trail ascends an east-facing slope that happens to be one of the wettest in the state and so its wild flower display is unparalleled. The trail is used by horsemen and is also open to dirt bikes. At 9,712 feet, Ben Lomond is the highest peak overlooking the Ogden area. From the summit, the Wasatch Range can be seen stretching 100 miles from the Idaho border to Salt Lake City. You also have great views out over the Great Salt Lake. 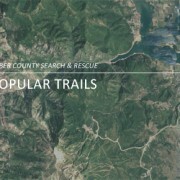 The trailhead is at North Fork Park, near the town of Liberty in Ogden Valley. From Liberty, head north on 3300 East and then go right where the road forks after about 1.5 miles. 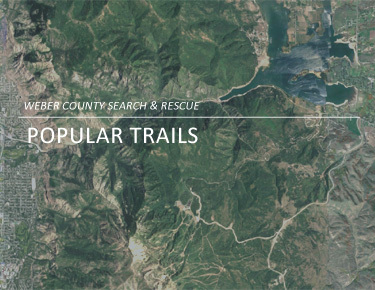 In another mile, turn left at the entrance to North Fork Park and look for the signed Ben Lomond Trailhead near the horse corral at the far end of the park. The climb to the top of Ben Lomond is long and can be challenging. After leaving the parking area the trail crosses Cobble Creek and begins a series of switchbacks up the mountain. There is a waterfall that cascades from Cold Spring at mile 1.6. Various trails intersect; just follow the signs to the summit. The trail switchbacks for most of the ascent, flattening out for about a mile before the final series of zig-zags up to the summit. The Beus Canyon Trail is part of the Great Western Trail. The Beus Canyon segment runs from the east side of Ogden City up to a saddle just south of Mt Ogden Peak. From that saddle it is just a short climb to the summit. From the saddle, the Great Western Trail descends down the east side following a Snowbasin access road and connects to the Wheeler Creek Trail. The trailhead is located at the top of 4600 South, on the east side of Ogden. Follow the street east until the road curves south near the microwave towers. The trailhead is signed. There is a parking area but no drinking water or restrooms. The lower part of the trail is easy as it climbs to the mouth of Beus Canyon, where it intersects the Bonneville Shoreline Trail. The trail continues along Beus Creek until it reaches a small meadow where the canyon forks. This meadow is locally known as Fern Valley, for obvious reasons. From there the trail continues along the south fork of the stream and then climbs the ridge between Beus Canyon and Birch Canyon to the south. The trail continues to climb at a steep pitch as it goes north to the head of Beus Creek. From there, follow rock cairns to the saddle just south of Mount Ogden Peak. Mt Ogden Peak has an elevation of 9,501 feet. From the top you can see almost forever. There is a radio tower on the summit, and some think it distracts from the aesthetics of the hike. Nevertheless, views from the summit make the hike worthwhile. It is possible to hike from Ogden up Beau Canyon and over the mountain to Snowbasin. However, most people are more interested in hiking out and back to the summit. The shortest route to the summit is from the Snowbasin side, following the jeep access road. However, the Beus Canyon Trail is more scenic, and more convenient for people living in the Ogden area. This short but strenuous hike includes a rugged scramble over steep, rocky terrain, yet it has long been one of Ogden’s most popular hikes thanks to the spectacular 200-foot waterfall at the upper end of the canyon. Please respect the private property on both sides of the trail and don’t be tempted to climb the cliffs around the waterfall. It’s illegal and several hikers have fallen to their deaths from the treacherous rocks. The total hiking distance is short but the hike is strenuous because you must cross steep, rocky terrain. The hike is out and back, you return the way you came in. The trail begins at the Mt Ogden Trailhead at the top of 29th Street, on the east side of Ogden. Several signed trails begin here. Follow the trail signed as Malan Falls. The first part of the hike is easy, as it climbs uphill to the Bonneville Shoreline Trail. From there follow the Shoreline Trail south to the mouth of Waterfall Canyon. Spur trails run in every direction but it is easy to follow the main trail. After crossing the wooden bridge at the mouth of Waterfall Canyon, follow the obvious trail along the south side of the small stream. After a short distance the trail crosses to the north side, again via a wooden bridge. From there just continue following the trail along the north side until you see the waterfall. To get close to the waterfall you’ll have to rock hop or wade the stream a time or two, depending on water levels. During spring and early summer you may have to wade. The final approach is difficult but well worth the effort.